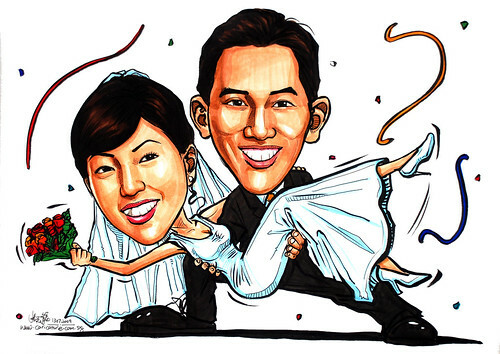 "Saw your ads recently, and I would like you to draw a caricature of me and my wife in Chinese Wedding costume for our wedding. ...We would like our theme to be western wedding." Not my ad, but a write-up on me by The Straits Times and The New Paper. These write-up indeed bring in some equiries for about 1-2 weeks, and then dies off. What is bringing me consistant business is my website and blog. Thank goodness they changed to Western wedding theme.